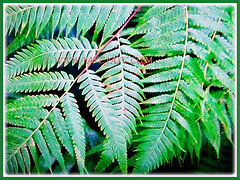 Golden Chicken Fern or Woolly Fern is unique and exotic as its rhizomes are thick, fleshy and densely covered by golden-brown hairs. 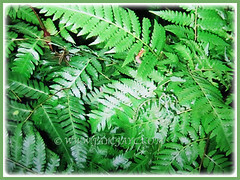 These ferns are found growing wild in wet and shady ravines, on hillsides and in mountainous regions. Botanical Name: Cibotium barometz (syn. : Polypodium barometz. Cibotium assamicum). 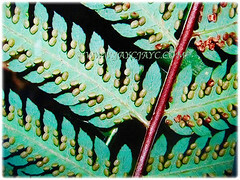 Common Name: Golden Chicken Fern, Scythian Lamb, Woolly Fern, Golden Moss, Bulu Pusi in Malay. Etymology: The genus name Cibotium means little box, referring to the sporangia. The specific epithet barometz is from the Tartar word barants and refers to the woolly rhizome of the fern. Origin: Native to Taiwan, China, the Ryukyu Islands (Japan), India, Indochina, Myanmar, Thailand, Malaysia and Indonesia. 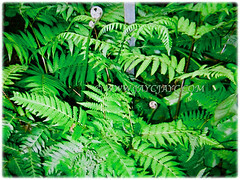 Plant type: An ornamental, rhizomatous and perennial fern. Features: Cibotium barometz is from the genus Cibortium that consists of about 11 species of tropical tree fern. 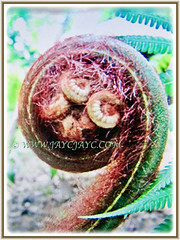 A large, slow-growing perennial and evergreen fern that grows up to 1 m tall when erect but is often prostrate with a creeping rhizome. Young plants are softly hairy throughout. 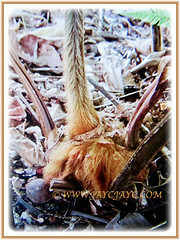 Rhizome is recumbent or erect, sometimes short and stout, woody and densely covered with soft, long and golden-brown hairs up to more than 4 cm long. It looks rather like a golden haired dog. 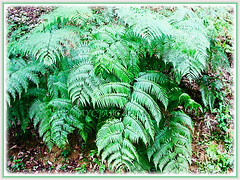 It produces fronds that are up to 1.5-2 m long. The large leaves are clustered, bases deltate and 3 times pinnately compound. 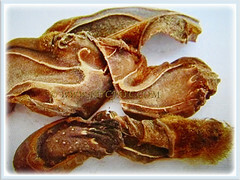 They are held on brown coloured and stout petioles, about 2 cm in diameter and up to 1 m long or more. Leaflets alternate, lanceolate, apexes acute, bases obtuse, margins finely serrated. Sori 1-5 pairs on pinnule segments, spores pale yellowish and with equal flange. Sori are born in the top edge of the lateral veins, slightly oblong, 2-12 pieces on each lobe and with brown lips-shaped lateral fissure of indusia. The sori are marginal on the pinnules. Culture (Care): Cibotium barometz or Woolly Fern grows easily with least maintenance. Light: Semi-shade with preference to bright light or filtered sunlight. Avoid full or direct sun that will scorch its leaves. Moisture: Moderate water requirements. Water regularly and thoroughly to wet its trunk and roots. It benefits when grown in a warm and humid environment. Soil: Humus enriched, moist, acidic and well-drained soils. Others: This fern requires shelter from winds. Prune off withered leaves to rejuvenate growth and keep it aesthetically pleasing. Mist the foliage weekly to keep it dust-free. 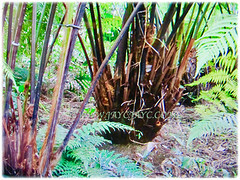 Browning tips and yellowing fronds are signs of dry air, thus increase humidity if needed. Feed once fortnightly with a liquid fertilizer for foliage plants. Generally free from serious garden pests. If necessary, you can use a diluted solution of the plant’s parts to control aphids and spider mites should there be any infestation. Cibotium barometz or Woolly Fern is not very hardy and normally requires to be grown in a greenhouse or conservatory. The best harvesting time for the rhizomes is during autumn and winter. After all the radicles and the yellow hairs covering them have been removed, the rhizomes should be chipped into slices, dried in the sun and kept for later use. You can grow this beautiful perennial fern in a pot, outdoors during the hot seasons and overwinter indoors with reduced watering and stop feeding. Propagation: Propagated by spores that are collected from mature fronds of healthy plant. Side shoots that form on the main trunks can be used to propagate new plant. Usage: Cibotium barometz or Woolly Fern are excellent to be planted in public parks and gardens. The rhizomes are anti-inflammatory and vermifuge. They are used in the treatment of rheumatism, lumbago, sciatica, leucorrhoea, dysuria and polyuria in the aged. The yellow hairs on the rhizomes contain tannins and are astringent. 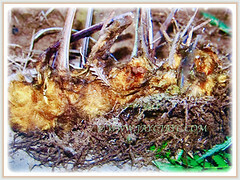 Rhizomes and roots are collected and used for treatment of ulcers, rheumatism and coughs. The yellow hairs of the rhizome are used as a styptic to stop bleeding and in a haemostatic poultice for wounds. In China and Japan, an extract of the rhizome is used as an anti-rheumatic to stimulate the liver and kidneys, strengthen the spine, expel wind and dampness and as a prostatic remedy. Cut the rhizomes really small, dry them and then boil. Drink the water to bring up body heat, tonic for heart and kidney, strengthen back portion of spine and knee, prevent rheumatism, body aches and strengthen overall health.